My mission away to Uzbekistan with Médecins Sans Frontières, working in a drug-resistant tuberculosis programme, has metamorphosed into just a handful of images that flash through my mind whenever I’m not distracted by more pressing matters. My morning commute is now spent sipping a latte and applying mascara, bobbing along on the London Underground, rather than suppressing chattering teeth on a white-knuckle ride in the back of a land cruiser. Gone are the basic facilities, the blue, Cyrillic Ministry of Health signs and the steady stream of emaciated patients coughing into their surgical masks. I once again work in a swish, teaching hospital in an extremely affluent area of this resource-rich, cosmopolitan city. Suddenly my two worlds-collide: our team has reached the room of one of the relatively few cases of multi-drug resistant tuberculosis (MDR-TB) to have been diagnosed in the UK. I pull on a respirator mask and it is bizarrely comforting, having worn them almost continuously for the previous year. I flip open the patient’s prescription chart…hello old friends: moxifloxacin, prothionamide, cycloserine…the hours I spent gently coaxing my patients to swallow you. My heart feels ready to burst with tragic tales from Central Asia. Tales of much loved patients. Always brave, always heroic, often smiling despite their predicament, each one fighting their own private battle until the end…Some still alive. And some now at peace, no longer tortured and tormented by TB, lying quiet in the ground. But the ward round has already moved on. ‘It is such a bore treating MDR-TB,’ comments one junior member of the team, ‘the patients end up staying in forever.’ And I wonder when again I will be able to relate to my peers. Friends, family, fellow MSF veterans all try to reassure me that this is just ‘readjustment’. No big deal. I’ll settle back in soon enough. Or is it that I will just become numb again to working on the more sunny side of a world in disequilibrium? I flick on the BBC News as I get ready for work in the morning and am greeted with the horror of the aftermath of the Philippines typhoon. I then travel to work and plough all of my training and a huge amount of energy and resources into looking after a relatively small handful of very stable patients. What’s going on here? The life-saving tally is currently running embarrassingly low. No, this is not just reverse culture shock that I am experiencing. I am feeling overwhelmed by the gross injustice that is the discrepancy between the need and the provision for healthcare across the globe. And this discrepancy is epitomised by the current epidemic of drug-resistant tuberculosis, death-marching its way across resource-limited regions of the world. Here in London, we will perform an array of investigations on patients just to ‘rule things out’, whilst only one in five patients with deadly drug-resistant TB in the world can’t even access treatment. Where did we lose perspective? How did it become acceptable that we throw the book at those who ‘have’, whilst leaving those that ‘have not’ clutching at so little. Shouldn’t we take one collective step back? It is not that I would want to deny people in resource-rich settings good medical care – not at all – just shouldn’t we start aspiring to offer it to all? Should it really matter where you happened to be born? Shouldn’t we all become Doctors Without Borders? That evening I tell my husband that we are quitting our jobs and leaving on a plane with MSF within the week. He looks at me exasperated – he has had to bear the brunt of my ‘readjustment’ the hardest. So…today is World TB Day. One year ago today I was in my MSF project trying to claw back patients that were clinging onto life. The crass drugs that are currently available for the disease meant that we were tragically only able to cure about half. The need was and remains immense. But MSF, amongst others are working sheer, bloody mindedly to turn this situation around. And we need your help. 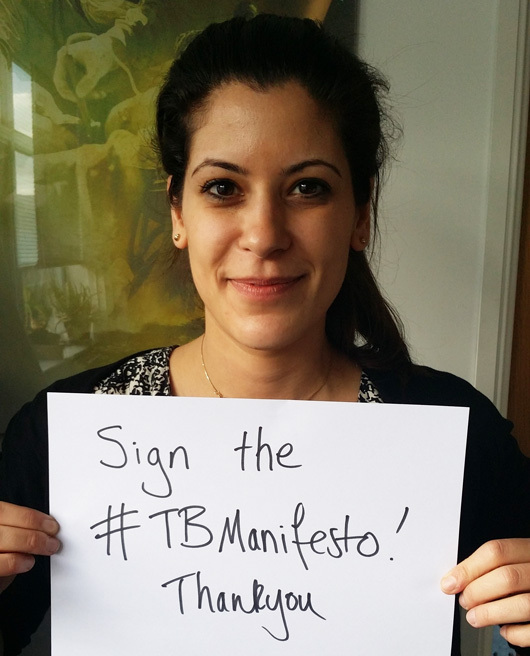 Please sign the MSF Access Campaign TB Manifesto, which we plan to present to world health leaders seven weeks from now, demanding they arm us in combating this disease. Please sign it, so that we can begin to get things into perspective this World TB Day. A few weeks ago I fell asleep with the radio on and woke up just as an athlete was being interviewed. He was describing, in particular, being an Olympian. He reported it was like having a fire that burns silently and strongly inside of you and on occasion, when the time is right (in this case every four years at the Olympics) that fire roars and you show exactly what it is you have in you to give. And with that, for the first time, someone had put into words what it was for me to have worked for MSF. So no, I’m sorry, but I have not yet quite scratched that itch.